Elizabeth Warren greeted supporters Saturday. SPRINGFIELD - After facing growing questions about the durability of her Senate candidacy, Elizabeth Warren displayed brute strength Saturday by winning the endorsement of 96 percent of delegates to the state Democratic convention and blocking potential opponent Marisa DeFranco from the party’s primary ballot. The win allows Warren to instead focus on Republican Senator Scott Brown in the general election. DeFranco left the convention hall without a formal press conference. Before the results were announced, and as it was becoming evident that she would not make the ballot, she said would not commit to endorsing Warren. But she also seemed prepared to return to her North Shore immigration law practice. Speaking at a labor breakfast Saturday before the annual state Democratic convention, Elizabeth Warren said she was ready for a “tough race” with Scott Brown. “I’m a real person with a real job, so I have other obligations to take care of,” said DeFranco. DeFranco submitted the 10,000 voter signatures needed to meet state qualifications for appearing on the Sept. 6 primary ballot, but under party rules, she also needed to secure the vote of 15 percent of the convention delegates to qualify. Party officials said they could not recall such a large margin of victory in a two-person nominating contest. Addressing the delegates before the vote, Warren said Brown would rather attack her family than talk about his own voting record. “Well I say this, if that’s all you’ve got, Scott Brown, I’m ready,” the Harvard Law School professor said to sustained applause. “And let me be clear: I am not backing down. 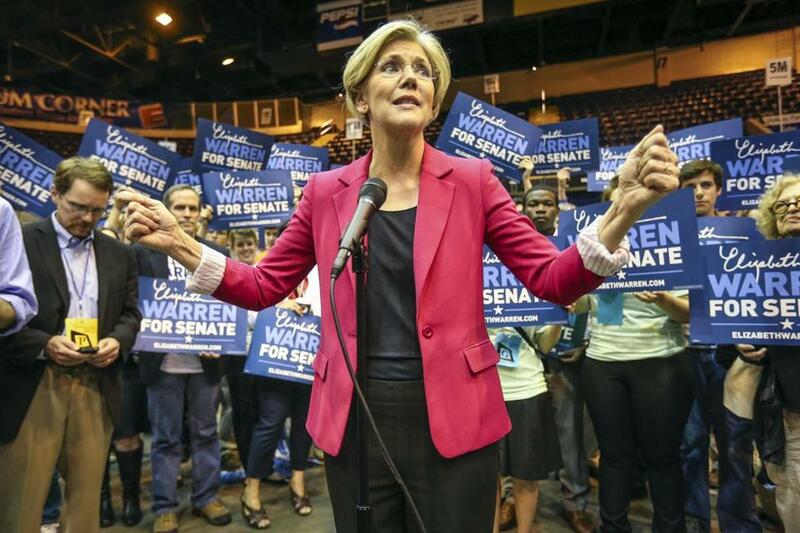 I didn’t get in this race to fold up for the first time I got punched,” Warren said. Warren, who called Brown a “Mitt Romney Republican” and a “Wall Street Republican,” listed a series of votes the incumbent had made, including votes against a Democratic bill to prevent a doubling of student loan interest rates and in favor of big oil subsidies. She also invoked the memory of the late Democratic Senator Edward M. Kennedy, who for 47 years held the seat that Brown won in a special election in 2010. “It’s a long way from Ted Kennedy to Scott Brown,” said Warren. In the days leading up to the convention, Warren made perhaps her most concerted effort to address several weeks of questions about her past claim of Native American heritage, which she has been unable to formally document. First, Warren acknowledged that she had told Harvard Law School and her previous employer, the University of Pennsylvania, of her Native American heritage, but said she did so after she was hired and that it had never been a factor in advancing her academic career. Brown has said the issue raises questions about Warren’s truthfulness. In a series of follow-up interviews, Warren provided more detail about the “family lore” that had convinced her of Native American ancestry. She said her mother and father had been forced to elope because of her mother’s background in the Cherokee and Delaware tribes. Warren attributed the lag in her addressing the controversy to needing more time to go back and recall details of events that had occurred decades ago. DeFranco had little name recognition and through the first quarter of the year had raised just over $41,000 for her campaign, compared to the $15.8 million that Warren’s campaign had pulled in. “For those of you who know me I don’t scare easily. I have a proven track record of ... taking on long odds and winning,” said DeFranco in asking for the votes of the delegates. Peter Blute, deputy chairman of the Massachusetts Republican Party, panned the final vote, even though it mimicked the GOP’s action two years ago when it blocked Christy Mihos from appearing on the 2010 gubernatorial ballot in favor of giving Charles Baker a clear shot against incumbent Governor Deval Patrick. “They took the opportunity to snuff out a burgeoning campaign because they were afraid she might raise some uncomfortable issues in a primary debate,” said Blute. The speech, similar to those he often delivers to party activists across the country, excited the thousands in the audience, prompting many to repeatedly stand and cheer. Patrick’s speech was far more nationally oriented than those by other speakers, praising President Obama and criticizing Republicans as unprincipled bullies, seeking power rather than principle. He singled out his predecessor, Mitt Romney for what he characterized as bad economic stewardship. Patrick then exhorted Democrats to stand up for Obama. Most of the state’s US House delegation also paid tribute to Barney Frank and John Olver, two retiring congressmen. “They stood up every day for men and women in the Commonwealth who wanted the opportunity to succeed,” said Representative William Keating, a Bourne Democrat. Representative James P. McGovern of Worcester called Frank “a Democrat who strikes terror in the hearts of Republicans” and alluded to the time the two men were arrested protesting the genocide in Sudan, joking that Frank was a lot of fun in jail. Olver, who lives in nearby Amherst, gave a short speech, but Frank did not appear on stage and was not evident in the convention hall. Also missing was Steve Lynch, the South Boston congressman who is the state’s most conservative Democrat. Material from The Associated Press was used in this report. Noah Bierman can be reached at nbierman@globe.com. Follow him on Twitter @noahbierman.